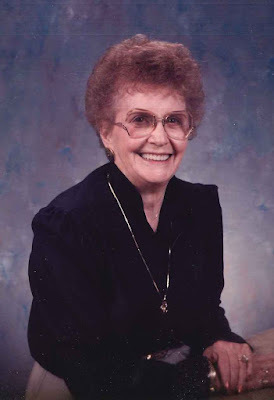 Hartis Katherine (Hayes) Collins, age 98, was born April 19, 1920 in Houston, Mo. She passed away March 10, 2019 in her Houston home. Hartis married Wayne Collins on May 3, 1939 and were together until his death November 6, 1966. Hartis was preceded in death by her parents, Herman and Etta (Haney) Hayes; husband, Wayne Collins; infant daughter, Deloris; 3 brothers, Willard “Wid”, Wilbert, and Robert “Jack”; five sisters, Hazel Wheeler, Helen Shelton, Tressie Smrek, Dorothy (Kell) Rauscher, and Vera (Dixon) Leek; grandson, Loren Neal; and daughter-in-law, Debbie Collins. She is survived by her three children, Jessie (Lance) Neal, Karen (Jim) Cavanaugh, both of Houston and Mike Collins of Poplar Bluff; grandchildren, Rhonda Neal, Quentin (Michele) Cavanaugh, Dan (Nicole) Cavanaugh, Grant (Shonna) Collins and Blake Collins; great-grandchildren, Lane and Mac Neal, Devin, Darby and Casey Cavanaugh, Dakota, Gunner and Gauge Collins; brother, Johnny Hayes; and sister-in-law, Betty Hayes. She grew up and raised her children in Ellis Prairie. She was baptized at Dogs Bluff on the Big Piney River on May 27, 1951, along with her husband and daughter Jessie. Following the passing of her husband she worked for nine years at the Lee factory in Houston prior to opening the Fashion Corner Dress store with her daughter Jessie. They operated the store for over 20 years making many friends and loyal customers. She was recognized by the Houston Chamber of Commerce for her distinguished service to the Houston community. In her free time she enjoyed gardening, sewing and playing pitch with family especially her grandchildren. She danced well into her 90’s at senior dances in Houston and the surrounding area. She enjoyed both going to and having her own yard sales. She attended auctions where she might buy anything from a dollar box full of treasures to a three bedroom house. A special thanks to Mom’s caregivers who filled her home with laughter, good food, stories and loving care during her last few months. Memorials may be made to Dykes Cemetery in lieu of flowers. You may express online condolences at www.evansfh.com. Services were held Thursday March 14, 2019 at 11:30 A.M. at Evans Funeral Home with Grant Collins and Kaven Keller officiating. Burial was in Dykes Cemetery under the direction of Evans Funeral Home. Pallbearers were: Quentin Cavanaugh, Daniel Cavanaugh, Grant Collins, Blake Collins, Lane Neal and Mac Neal.